It is taking me longer than expected to get back into a regular routine. This past week has been full of ups and downs, with my downs being particularly low. Part of it may be the sinus infection that E and I think we both have, which is leaving me more fatigued than just pregnancy fatigue. But we're coming closer on the end. That is my main encouragement. My only 'worry' is that once I find my new groove, the baby will come along and give me something new to adjust to. I just keep coming back to changes, and adjusting to those changes. There have been a few good days, even when E was working. I've been making precise plans, and actually got done what was needed. 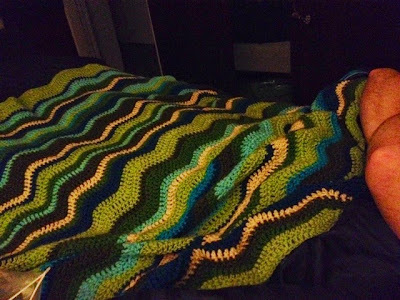 My extra time then became dedicated to finishing my biggest WIP, the 'wedding' ripple. In my typical fashion, I simply crocheted until I was sick of it, then called it done. It's not quite as big as I originally wanted, but it is finished. There are a few ends to weave, but I'm calling it. 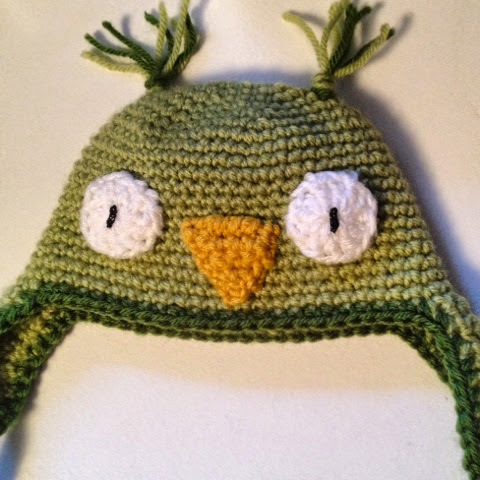 Riding on the coat-tails of that finish, I was motivated enough to finish one of my baby hats. There are several in progress, but I told myself I would get at least one done before Baby is born. Now I'm hoping to have two or three. Only two of them are actually for him, but getting extras done can always be a plus. My craft show stock on hats is low this year, so I've been hoping to get it up in these last few weeks. This green-- one of Vanna's Choice Baby-- was initially difficult to match, but after thinking it over and halting multiple times, I just decided to stick with another shade of green. Not living with my artistic sister can be such a drag sometimes, because she has always been my main color-matcher. I'm a lot less adventurous with my color choices, and mainly just stick to colors that are next to each other on the color wheel. My sister tells me that her method is exactly the same as mine, but I don't really buy it. She has some magical sense that just allows her to coordinate colors better than most people. Getting one hat done means I'm just a bit closer to getting more done, which is extremely motivating. Which brings me to more projects that need to get done. I've come back to my baby granny blanket, and added to that as well. It was started at Christmas time, when I brought a bag of Vanna scraps with me to my in-laws, because my oldest niece wanted some crocheting tutoring. 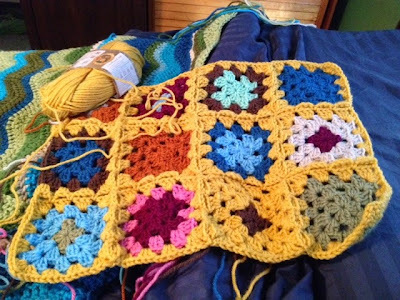 My brother-in-law was extremely frustrated that I was working on something that really had no coordination or purpose-- randomly colored granny squares can do that to even the most relaxed person-- so it was more an effort to tease him than anything else. But it turned into a baby blanket, now intended for our new little one. In an attempt to not overwhelm myself, I keep switching between projects. By finishing small things, the big picture looks tidier in my head. My sinus headache is still awful, but the edges around my crafting mess are starting to get smoother. Depression is an odd thing. I don't know even if these blues I've had for most of my pregnancy qualify as depression. But it's been a struggle. These moments of accomplishment, though sometimes small, are sometimes all I have to cling to in dark times. E has been amazing through all of this, praying with me and for me and taking on more than his share of the burden. Without his constant reminders, I think I would lose sight of who's really in control. These little accomplishments help me get back on track, with everything. Being grateful for the small things helps so much. And these small things get added to the list. I am grateful that I finally finished a baby project. I am grateful that even though he feels as sick as I do, my husband still helped with the dishes. I am grateful that our family has been blessed with life. I am grateful for changes that stretch me, and for normal things that give me comfort. ultimately having children, esp. young children, is learning to put them first and not one's self; it is a very hard effort but with God everything is possible. When I was going through a super hard time, the best loving wisdom I was given was this: Be with God today. Life is always full of changes and adjustments; they just seem more intense when it is marriage and then baby. But life if it was not going on with changes and adjustments would not be life. It is hard; esp. with kids one cannot make a lot of concrete plans; but you can be with God today. He loves you and can carry you and your child through these days. great work! LOVE the hat! Keep appreciating the small stuff! So glad your husband is with you on this. Take a deep breath! life is a series of adjustments and yes, when the baby comes that will be more adjustments. I am praying for you and hope you have joy and peace in the coming months. If you are suffering from an infection that would make anyone feel awful and under the weather!